The Differential probe SI-9002 extends the measurement power of oscilloscopes to power semiconductor circuits. 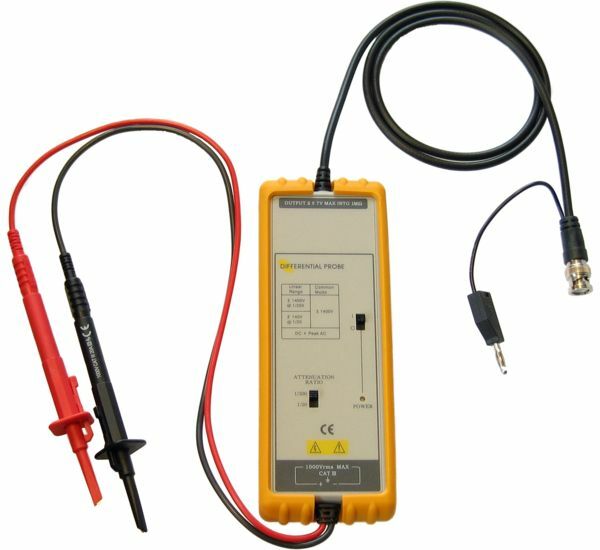 This Differential Probe provides any general oscilloscope with a high voltage differential input. The Differential probe SI-9002 is small and light, so it can be used in a very convenient way; just plug it into the input of, for example, the Handyscope HS5. The wide bandwidth and the high accuracy of this Differential Probe cater for a wide range of applications. Using a built-in differential amplifier, the Differential probe SI-9002 scales and converts the high voltage differential input to a low voltage single ended BNC output. The differential input is useful in measurements of power semiconductor circuits, as no reference to ground is required. Both the positive and negative sides of the balanced input possess high voltage differential input up to 700 V, and its sensitivity can extend down to 100 mV. With high bandwidth and high response speed, the Differential probe SI-9002 is adequate for accurate dV/dt measurement in the fastest switching circuits of thyristors, bipolar transistors, or power MOSFETS. The table below shows detailed specifications of the Differential probe SI-9002. Voltage limit is the lesser of the DC+Peak AC and RMS values. The supplied voltage must be less than 12V and greater than 4.4V, otherwise the differential probe could be damaged or can't be operated properly. Polarity is "+" inside and "-" outside. For wrong polarity, built-in circuit protects the differential probe, no danger or damage will occur. When the voltage of the cells become too low, the power indicator on the panel will flicker. Information: When using the Differential probe SI-9002 in combination with a Handyscope HS4 DIFF or a Handyscope HS6 DIFF without option SafeGround, an extra grounding connection between the instrument and the Differential probe SI-9002 is required. When ordering a Differential probe SI-9002 to be used with one of these instruments, please mention that you also want the extra ground lead for the Differential probe SI-9002 and specify for which instrument. Information: When using the Differential probe SI-9002 in combination with a Handyscope HS6 DIFF with option SafeGround, the used input channel of the scope must be set to single ended.